1900's Walkerton IN memorabilia. 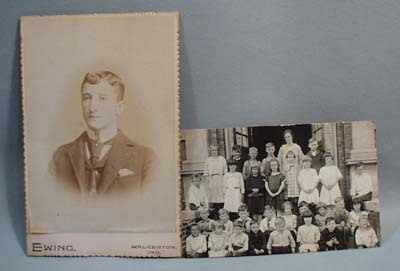 5 Items, A photo (6 1/2 x 4) from the Ewing Studio, Walkerton, Indiana, featuring a man with a neat watch fob, A classroom postcard (3 1/2 x 5) photo, but I am not familiar with the school, a 1908 Presbyterian church program( 5 1/2 x 8 1/2"), A Dance Invitation Check (4 x 2 1/2")at the Walkerton Ten K.O.T.M No 159, October 11, 1901 & a ticket admit (1 x 3") to Singleton & Milliken May 30 1900. These were part of a scrapbook, & 2 are marked Walkerton, & the other 3 were with them, & I am assuming they are Walkerton or close by. 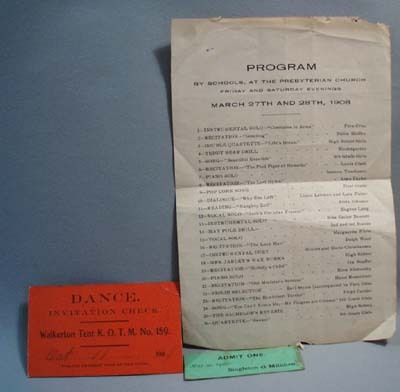 Items Similar To "1900's Walkerton IN Memorabilia 5 Items"